Why the bicycle accident attorneys at Berman & Riedel, LLP? Because we not only litigate the most serious bicycle accident injury cases, and we have not only received top ratings including recognition in 2009 and 2010 as a Top-10 personal injury attorney in San Diego, but several of our attorneys cycle. We cycle locally, and in events through the Western United States. As top rated personal injury lawyers and cyclists, we not only understand the law, but we also understand the sport of cycling. We understand that drivers fail to pay attention to cyclists on the road and cause serious bicycle accidents. We understand that bicycles and component parts sometimes fail, resulting in severe injuries and accidents. We understand that dangerous conditions on public and private property often lead to bicycle accidents. And we understand that event organizers and vendors sometimes create dangerous conditions that result in bicycle accidents. There are many circumstances that result in serious bicycling accidents… all this we know. Dedicated to helping those who have been injured as a result of the negligence of others, the attorneys at Berman & Riedel, LLP, have significant litigation experience in handling the most serious accident injury claims. 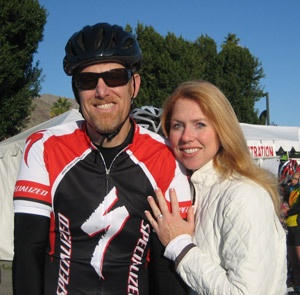 Our firm has worked hard to achieve great success in handling serious bicycle accident cases, and has built a reputation as one of the leading personal injury law firms in California by achieving outstanding results for our clients. What sets us apart from most other personal injury attorneys that handle bicycle accident cases is the fact that we understand the sport and the dangers associated with cycling. We handle the most serious of cases, and we are committed to ensuring that every client receives the personal care and attention that their case deserves. We take our role in representing injured cyclists seriously, and we strive to make sure they obtain the best possible results available under the law. If you or a loved one has been seriously injured as the result of the negligence of another, contact a San Diego bicycle injury attorney at our firm today. Case consultation and evaluations are free of charge. In calling us, you will see the dedication of our attorneys and staff is unparalleled. We are aggressive in our pursuit of every bicycle accident case we undertake and committed to serving our clients by providing the absolute highest quality legal representation available. Bicycling is one of the most popular forms of transportation, sport and leisure in the United States, particularly in Southern California where we enjoy great weather year-round. In the past two decades, interest in cycling has grown exponentially and as a result more communities have increased their efforts to encourage car drivers to “Share the Road” with bicyclists by widening streets and establishing designated bike lanes to help keep cyclists safe. Despite all of the awareness and support for increased safety on San Diego roads, more bicyclists on the roads means more opportunities for bicycle and automobile collisions. Unfortunately, when bicycles and automobiles collide, the consequences can be deadly; in fact, California’s fatality rate for cyclists in traffic accidents is one-and-a-half times the U.S. average. Berman & Riedel, LLP, is one of the premiere personal injury law firms in California and has extensive experience handling cases in which our clients have suffered a full range of injuries which occur from bicycle accidents, be it from broken bones to a brain injury. Our attorneys understand the challenges associated with litigating complex personal injury cases, and can provide the legal experience and skill necessary to obtain the maximum compensation for any injury suffered by you or a loved one. People who ride bicycles on streets and highways have all of the same legal rights and privileges as motorists. Cyclists who are injured while riding on public roadways may be entitled to compensation for their medical expenses, lost wages and pain and suffering. While the cause of the accident is critical to legal recovery, the law protects those who are injured through the negligent acts of others. The San Diego bike accident attorneys and staff of Berman & Riedel, LLP have exceptional experience representing clients who have suffered injuries due to the negligence of others. That is what we do; we only represent the injured parties and do not represent insurance companies or business in defending harm they have caused. Our professionalism and dedication to our clients is unsurpassed, and our firm has the skill and resources necessary to obtain the maximum compensation to which our clients are entitled. If you or a loved one have been injured while cycling, contact an attorney at Berman & Riedel, LLP to discuss your legal options. Sometimes, in spite of a cyclist’s best efforts to legally and safely ride their bicycle on public roadways, he/she can suffer injuries due to the negligence of another motorist. In 2009, over 51,000 cyclists were injured and 630 cyclists were killed during traffic accidents in the U.S. The most common causes of bicycle traffic accidents include alcohol/drug impairment of the motorist or cyclist, visibility, and failing to follow basic traffic laws such as signaling before making a turn or changing lanes. If you or someone you know has suffered an injury while riding your bicycle because of the negligent or faulty acts of another, please contact Berman & Riedel, LLP for a free consultation regarding your legal rights. ALWAYS WEAR A HELMET: Head trauma is by far the leading cause of death occurring as a result of cycling accidents. Wearing a helmet significantly reduces the risk of suffering a traumatic brain injury or death in a bicycle accident. RIDE WITH TRAFFIC: Cyclists are required by law to follow all of the same traffic laws as automobile, motorcycle and truck drivers. Stay to the right of traffic to reduce the risk of accidents and use hand signals to alert motorists when you are turning or stopping. Riding with traffic makes a rider more visible and will greatly reduce the risks of an accident. BUDDY SYSTEM: Whenever possible, ride with one or more companions. This increases visibility and can be helpful in the case of an accident or bicycle malfunction. For more information regarding bicycle traffic accidents in California and the U.S., visit the U.S. Department of Transportation’s National Highway Traffic and Safety Administration website at www.nhtsa.gov. If you have a question for one of our bike accident lawyers, do not hesitate to contact us today.